Though conceived in the same tense period after Munich that saw official support for the Bristol Beaufighter concept, de Havilland’s private venture design for a high-speed unarmed reconnaissance bomber had to survive sustained and profound official discouragement. Thus it was March 1940 before a production contract was offered for the DH.98 Mosquito, and late November 1940 before a prototype took to the air. The first Mark I reconnaissance aircraft entered RAF service in September 1941, followed by the Mark IV bomber version in November 1941, and the Mark II fighter variant in January 1942. The success of the design was quickly apparent. Numerous Marks were developed in rapid succession and built in large numbers. 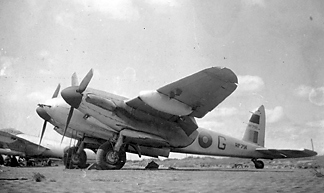 Versatile and highly successful in many roles, “the ubiquitous Mosquito and its admirable equipment” served the RAF with distinction in World War II and long afterwards. Flap extended, here—the usual 211 Squadron practice. In the background, the otherwise-anonymous ‘Z’, then another parked Mosquito, while a fourth taxies up to the flightline. This aircraft is also shown in close-up with W/O AB Wythe. Like the Beaufighter, the importance of the Mosquito has been widely recognised and there is a vast literature readily found in libraries, bookshops and on the Web. Designed for the fighter-bomber role, the FB VI first flew in mid-1942. 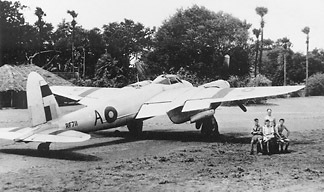 Nearly 2600 were built, more than any other of the 40-odd Mosquito variants. Armed with four 20mm cannon, four .303in machine guns and capable of carrying two 500lb bombs internally plus externally-racked bombs, rockets or drop-tanks, the FB VI was admirably suited to the sort of strike role that had been the Beaufighter’s forté in the Burma theatre. However, in the Far East (and despite prior local testing), the extremes of heat and humidity found out weaknesses in the bonding of plywood skins, wing spars and booms, which could lead to skin delamination and wing spar failure. Investigation of the problems saw Mosquitoes in the Far East stood down from service for a period in late 1944 and, for 211 Squadron, again in late 1945 and in January and February 1946. Fighter-bomber.Twin-engine, mid-wing cantilever stressed-skin wooden monoplane. 2xRolls-Royce Merlin 25 V12 engines of 1,635hp, two-speed supercharging, 100 octane or 150 grade fuel, maximum boost +18lb in M gear on take-off, 5 minute combat limit +25lb boost with 150 grade fuel in M or S gear. 4x20mm cannon and 4x.303in Browning machine guns, fuselage mounted. 2x500lb bombs internally. External load: 8xrocket projectiles (25lb AP or semi-AP, or 60lb HE), or 2x500lb bombs. Internal fuel capacity 453 gallons: 50 gallon internal tank, 2x143 gallon inner-wing tanks, 2x58 gallon outer wing tanks. 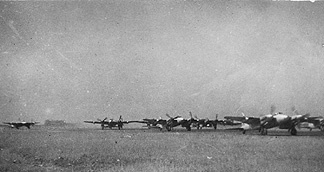 As the end neared in the Far East, 211 Squadron stood down from operational readiness in May 1945 to convert to the Mosquito. Ready to resume operations for the expected invasion of Malaya in August 1945, they were forestalled by the surrender of Japan. Unfortunately, at that late date the Operations Record Book records few details of the aircraft allocated to the Squadron, however, some information can be gleaned from the relevant Air Britain volumes, RAF Aircraft HA100—HZ999 (J Halley, Air Britain 1989) and RAF Aircraft PA100—RZ999 (J Halley, Air Britain 1992). Since this page first went on-line, entries from the Pilot’s Flying Log Books of Tom Taylor, Eric (Ricky) Watts, Monty Walters and Doug Winton, with photographs from Doug, Monty, and Jeff Jefford have together added a great deal to the sparse official and published record of Mosquito service with 211 Squadron. Following initial conversion lectures, flying training began on 11 June. 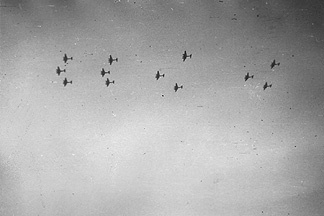 Aircraft now known to have been on Squadron charge at this period may represent the entire complement of 18. *Flown frequently by F/Sgt T Taylor from September to November. The RF serialled FB VI aircraft were all part of a batch of 300 with Merlin 25 engines, built by Standard Motors between December 1944 and June 1945, while TA500 was built by de Havilland at Hatfield. Lost without casualties on 31 January at Don Muang, this fine three-quarter rear view shows ‘A’ in happier days at St Thomas Mount. 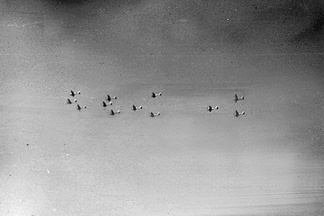 The usual small amount of flap extended, as virtually every 211 Squadron Mosquito ground shot shows. Of the four men, two are shirtless, right, and may be groundcrew, given the apparent age of the standing man. The uniformed figure, left, may be wearing flying boots, while the central seated man wears a side cap and at least a Flight Lieutenant’s rings—perhaps the pilot, possibly F/Lt Pete Smith. As the attap hut and palms suggest, the scene is not Don Muang. Originally from the collection of ex-45 Squadron airman LAC David Leggatt, the 45s and 211s did find themselves briefly stationed together at St Thomas Mount in October/November 1945. Palms of just this sort were certainly to be seen close by the airfield there at that time. Quite likely the answer. The old hands (Ricky Watts, Monty Walters and Doug Winton) viewed this shot, kindly supplied by “Jeff” Jefford, with great interest. Monty flew this machine on a number of occasions: 26 June Yelahanka; 18 July St Thomas Mount; 14 November Akyab (formation flying). B-Baker RF751 flown by F/Sgt Ray Wood (Nav/W Johnny Sleight) taken from Mosquito S-Sugar RF765 (with ME Walters the pilot and Nav/W Ron Kemp) who are tucked well in. 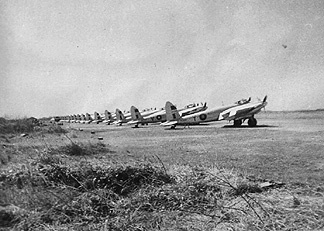 Training at St Thomas Mount near Madras before flying to Akyab, on 17 July 1945. Monty kept another shot of this flight. 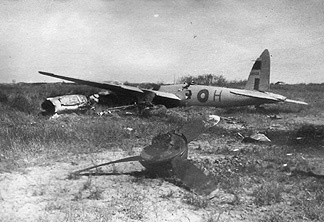 Crashed on a village in the course of a Spitfire affiliation exercise on 29 June. The pilot, 1432334 W/O Geoff Lowcock and 1575737 W/O William Wilkes, another pilot “sitting in”, both died instantly. By awful chance the crash occurred on the day of a local festival and 38 villagers also died in the resulting explosion and fire which destroyed several buildings. They were laid to rest with full military honours the next day in Bangalore Military Cemetery and today lie in Madras War Cemetery. Crashed in the course of a formation shallow dive-bombing display on 2 July, 28 miles North of Bangalore. Sadly, the pilot 1455066 W/O Kenneth Webster misjudged the pullout and the aircraft disintegrated on impact with the ground. Webster and his Nav/W 1550365 F/Sgt Jack Hopes both died. They too were accorded full military honours the next day at Bangalore Military Cemetery and rest today in Madras War Cemetery. The Squadron moved to Don Muang in Thailand, arriving on 27 November 1945 with 18 Mosquito aircraft. After further expert searching at the UK National Archives, the seemingly missing pages of the Squadron Operations Record Book for December 1945 to March 1946 were found in the right place after all and have shed much light on this rather testing period, as have the log books and photographs referred to above. *Earlier reference to RF630 ’D’ appears to be an error, that serial lying in a blackout block, while other equally good primary sources, before and after the date of the doubtful entry, have RF653 ‘D’. **Like the RFs, the TEs were Standard Motors built aircraft. At Don Muang, they suffered a number of accidents on landing or in the circuit, and sadly encountered more serious structural problems with their aircraft, one of which broke up in bad weather on a long flight to Singapore, causing the Squadron’s final losses of the Second World War. Swung on take-off at Don Muang, 5 December 1945. The pilot was unable to correct the swing and in the resulting ground loop the undercarriage collapsed. Though unremarked in the Operations Record Book, Monty Walters has a number of fine shots of this spectacular accident. No casualties, though Monty’s other shots of the incident show that the aircraft was practically reduced to components. Broke up in mid-air 10 miles SSW of Ipoh in Malaya, 13 December 1945, on a courier flight to SIngapore with the loss of F/O Stephen Falconer Dunnett 179774 and his passenger, a “Mr England of the Rice Commission” according to the Operations Record Book. There may have been some connection with W/O Arthur Eric England 1270380, posted missing from a Beaufighter operation on 24 September 1944. The final honours were rendered the following day by a funderal party from RAF Butterworth with F/O Donley and F/O Glossop of 211 Squadron in attendance. Dunnett lies at rest in the Taiping War Cemetery. The CWGC Graves Registration Report Form that includes Dunnett also records a “Civilian, formerly 120560 Captain James Edward England MC Intelligence Corps” with the same date of death and noted “No Register Entry”. Cpt England’s final resting place remains unrecorded. Engine cut, lost height and crashlanded with both engines out in the circuit at Don Muang on 31 January 1946 without serious injury to the pilot W/O Ashcroft or to his passenger Cpl Edwards. Also flown on a “local” by F/O Winton, 11 August 1945 shortly after arriving on the Squadron at St Thomas Mount. Another of the many shots that show a 211 Squadron local practice: leaving the aircraft parked with an amount of flap extended. Doug Winton recalled that “flaps down” was the rule if the aircraft was to be left for an extended period. If the pilot forgot, then the groundcrew would do so. There is some thought that it helped look after the hydraulics in the hot climate. Operationally, part of the start-up procedure was to cycle the flaps down then up once on each engine, to test for pump failure. Aircraft were not taxied with flap extended. This shot on a hot day, probably at Don Muang, gives RF819 its call-letter and catches the aircrew and senior groundcrew together in a cheerful pose. Left, shirtless, may be the ‘A’ flight Sergeant rigger, Jock Hunter. He was a Scottish Badminton Champion. Next to him in India-Burma theatre bush hat, Dave Haddock, the ‘A’ Flight Sergeant Fitter. Haddock was an ex RAF Halton Boy, and Ricky recalls, “one of the nicest and most helpful and professional bods I've met”. 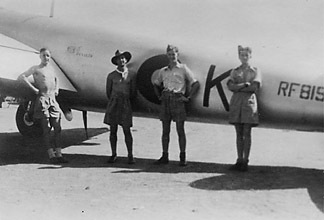 Next, centre right, hands on hips, is pilot Ricky Watts himself, and on the right his Navigator Harry Morrell. Seriously damaged by fire, 17 December 1945. While engaged in a four aircraft formation flight, F/Sgt Kneebone detected fire in the cockpit and immediately broke away to make a very good landing with smoke issuing from the rear of the cockpit and the starboard side of the aircraft. The fire was extinguished but not before the aircraft suffered serious damage. On investigation, it was determined that some electrical wiring and fuses had been removed in an unauthorised modification, leaving the electrical circuits unprotected from overload. Initially held in stored reserve for the Squadron, to active use from mid-January 1946 in view of reduced serviceability of other aircraft. Allocated to the Squadron CO. The mid-air break-up of Dunnett's aircraft in mid-December 1945 had been followed by repeated stand-downs of all aircraft for spar inspection and maintenance. There were sufficient aircraft ready for the great Bangkok Victory parade flypast on 19 January 1946, in the presence of the King of Siam (Ananda Mahidol, Rama VIII, who had recently returned to his country) and the SEAC Supremo Lord Mountbatten. Monty Walters was right on the spot, to photograph what was to be the last formal Squadron flying formation. These shots were all taken that day. Led by the late S/Ldr FM Bruckshaw. The late Tom Taylor and Vic Broome are there too, flying RF765 ‘S’. However, the following day, 20 January 1946, all 211 Squadron aircraft were grounded again for inspection and repairs, completed by the end of that week. Almost immediately a Special Technical Instruction called for more extensive inspection, which found just three of the eighteen aircraft on strength to be serviceable. This development quickly drew a reversal in policy, with the issue in early February of advice to prepare for disbanding, followed on 22 February by the formal signal to disband the Squadron. Late that month, at least nine aircraft had been brought to a state where they could be flown away to Seletar for spar inspection and possible repair, with three aircraft remaining at Don Muang to be prepared for a final fly-out in March. The structural difficulties of the de Havilland Mosquito have been discussed in a number of places, most tellingly by Jefford in The Flying Camels (at Annex K). It was eventually determined that the initial problems were the result of a combination of poor mate-up of some structural members, poor gluing practices and failure of glued joints, apparently most common among Far East aircraft after prolonged outdoor storage. It also appeared that swelling of the top skin could lead the securing screws to pull through. Subsequent examination of European theatre aircraft found a much lower prevalence of joint defects, and no lifting of wing skins. Further investigation in India identified two main defects: the wing spar scarf joints, and the spar boom joints with the plywood skin and other ply members, leading to lifting of the upper surface plywood skin. Consequently, Modification 638 was adopted: adding a spanwise plywood strip to seal the upper surface skin joint along the length of the front spar; along with application of protective aluminium dope overall (from February 1945). Despite these efforts, in the tropical conditions of the Far East the combination of heat and water soakage continued to give rise to swelling and shrinkage, resulting in spar defects until as late as 1954.